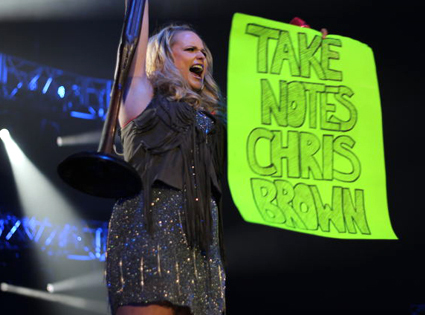 The feud between Miranda Lambert and Chris Brown has started during the recent Grammy Awards. Miranda Lambert has expressed her disgust in Twitter after Chris Brown's performance in the Grammys. In her concert last Thursday, she slammed Chris Brown again before she performed the song, "Gunpowder and Lead." Lambert has pulled out a poster with the words "Take Notes Chris Brown." In a statement to her crowd, she said, "Get a good picture now, put it on Twitter. I've been in a world of hurt with Chris Brown fans lately...but see, I just have to speak my mind because where I come from, beating up on a woman is never OK."